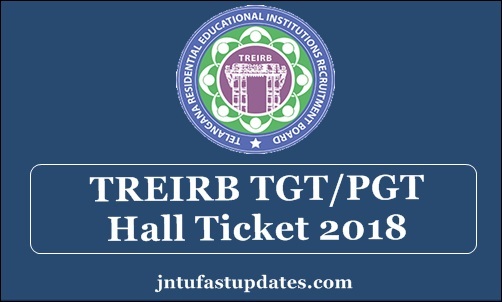 TSPSC Gurukulam PGT TGT Hall Ticket 2018: Telangana Residential Educational Institutions Recruitment Board (TREI-RB) has scheduled the Gurukulam Teacher written test for PGT Paper 2 & 3 exam on September 28th to October 8th and Tgt pgt paper 1 will be conduct on October 6th. TGT Paper 2 & 3 exams will commence from October 11th to 24th. Hopefuls applied for the Telangana Gurukulam Teacher posts can get the admit cards from the TREIRB official website, treirb.telangana.gov.in. Aspirants applied for Post Graduate Teacher (PGT) & Trained Graduate Teacher (TGT) posts will have to attend the examination along with the admit cards. The examination will take place in many examination centers across the Telangana state. Hopefuls applied for Gurukulam TGT and PGT posts can check the examination venue, exam date and timings details from the admit cards. Hopefuls who do not show the admit cards at the time of verification will not allow attending the test. The competitors can check more details, and guidelines for the examination of the hall ticket/admit card. Telangana Residential Educational Institutions Recruitment Board (TREI-RB) has recently advertised the notification for 2932 Post Graduate Teacher (PGT) & Trained Graduate Teacher (TGT) posts. A large number of qualified aspirants have applied for the Telangana Gurukulam Teacher posts this year. The organization has announced a large number of posts this year, so the competition is also high for the announced posts. The application process was held in the months of June/July. A massive number of interested and eligible aspirants have applied for the Telangana Gurukulam TGT/PGT posts. The selection of aspirants will be done through the written test and interview rounds. Hopefuls need to clear all the rounds with good merit to get the job as Gurukulam Teacher in the state of Telangana. The organization is ahead to conduct the TREIEB TGT/PGT written test in the month of August. Hence the applicants can get ready to appear for the test. Admit card/hall ticket is the most required document to proceed with the examination. Hopefuls applied for TGT and PGT posts in the state of Telangana can download TS Gurukulam TGT/PGT Admit card from the TREIRB official portal mentioned above. Hopefuls must have to download the admit cards before proceeding to the examination. Hall ticket/ admit card is the mandatory document to proceed with the examination. The hall ticket will be accessible to download on TREIRB official portal, treirb.telangana.gov.in before 10 days of the examination (tentatively). All the hopefuls are advised to download and preserve the admit cards safe to proceed with the examination. The contenders can download Telangana Gurukulam TGT/PGT teacher admit card 2018 and observe the details of examination center, date and time of the examination and other details from it. The TREIRB is going to publish the candidate’s name, date of birth, signature, picture of the candidate, signature of the candidate and other details on it. Once after downloading the admit card, check all the details printed on it. Hopefuls must carry any of the valid identity proof such as Aadhar Card/PAN Card/Driving Licence/Passport/ Vote Card/Ration Card or any other identity proof copy along with them. The examination officers will observe the details of candidate’s hall ticket and identity card to let them continue with the examination. Also, it is important to be on time. All the competitors must report before 30 minutes of the examination. ఈనాడు, హైదరాబాద్‌: గురుకులాల్లో పీజీటీ, టీజీటీ పోస్టుల రాత పరీక్షల షెడ్యూల్‌ను తెలంగాణ‌ గురుకుల నియామక బోర్డు ప్రకటించింది. పీజీటీ, టీజీటీ పోస్టులకు పేపర్‌ 1 పరీక్షను అక్టోబరు 6న నిర్వహించనుంది. పీజీటీ పేపర్‌ 2, పేపర్‌ 3 రాతపరీక్షలను సబ్జెక్టుల వారీగా సెప్టెంబరు 26 నుంచి అక్టోబరు 4 వరకూ.. టీజీటీ పరీక్షలను అక్టోబరు 8 నుంచి 14 వరకూ నిర్వహించనుంది. ఆయా పరీక్షలకు సంబంధించిన హాల్‌టికెట్లను పరీక్ష తేదీకి 10 రోజుల ముందుగా అందుబాటులో పెడతామని నియామక బోర్డు పరిపాలనాధికారి నవీన్‌ నికోలస్‌ తెలిపారు. For downloading the hall ticket for TGT and PGT post, Candidates are required to login. After login towards the left side, there is a link by name “Download Hall Tickets. From there you can download the Hall tickets of Paper-I, Paper-II & Paper-III. Visit the TREIRB official website, treirb.telangana.gov.in or from the direct link given below. Search for TS Gurukulam Teacher [TGT/PGT] admit card 2018 on the homepage. Click on the link after finding it. Login with the details of register number, password etc. The hall ticket gets downloaded on the screen. Look at the hall ticket and go through all the details clearly once. Take a printout of it to carry it to the examination. Is it TRUE physical science PGT exam rescheduled to 28-Sep-2018 ?